As the mobile ecosystem continues to expand to include more and more vertical sectors, healthcare, perhaps more than any other, is emerging as an area that has the potential to deliver the most striking benefits to consumers. Recent research conducted by research2guidance in collaboration with health and IT body HIMSS Europe assessed the market readiness of the 28 EU member states for the adoption of mHealth into patient treatment and care against 26 different criteria. The study, which indexed the views of 5,000 participants, found that Denmark, Finland, the Netherlands, Sweden and the UK are the top five countries offering the best market conditions for mobile health app companies. You can download the full report from the research2guidance website. As part of the largest global mHealth research programme, research2guidance and HIMSS Europe have come together to analyse the market readiness of the 28 EU member states through “The EU Countries’ mHealth App Market Ranking” survey. More than 5,000 app developers, healthcare professionals and mHealth practitioners were asked to share their opinion on EU market conditions. The practitioners view is combined with facts based evaluation for each country, based on five dimensions and 26 market condition criteria such as eHealth adoption, level of digitalization, market size and health expenditure, ease of starting a business and the mHealth regulatory framework. 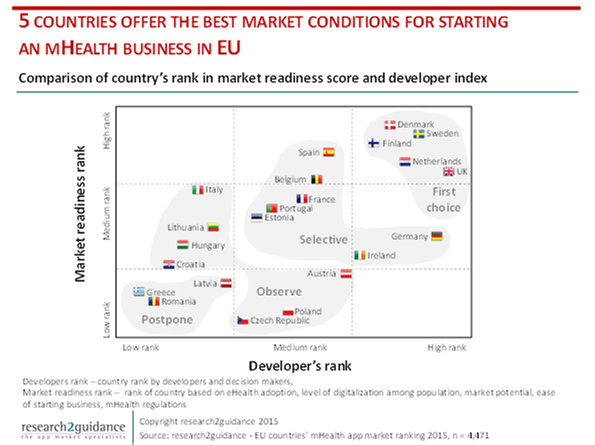 Denmark, Finland, The Netherlands, Sweden and UK offer the best market conditions and proved to be the best starting points for mHealth companies. The UK emerged as the leader among those countries according to 55% of mHealth practitioners. The study revealed that this is mainly because of positive attitude of physicians in the UK to use technology and integrate mHealth solutions into patient treatments. Germany and France are the most complicated markets in EU for mHealth: on the one hand these two markets have enormous potential when it comes to the amount which has been invested in patients, doctors, hospitals and healthcare on a whole. However, rankings for eHealth and mHealth adoption in Germany and France were extremely low, showing these countries are more reluctant to embrace the digitalisation of healthcare, thus classifying themselves as “average” countries to invest in mHealth.